If you've ever dreamed of sailing to exotic places, watching dolphins dance along your bow, or anchoring near your own private island, now's your chance! S/V Pipe Muh Bligh, a 2005 Catalina Morgan 440 Deck Salon, is home to her original owners - a full-time cruising couple who has sailed from Kemah, Texas, to the Bahamas, Dominican Republic, and Eastern Caribbean. "Pipe" is the ideal boat for a couple, but has plenty of room for children or visitors. She has the solid, stable hull of a Morgan, coupled with light, bright interiors that Catalina yachts are known for. 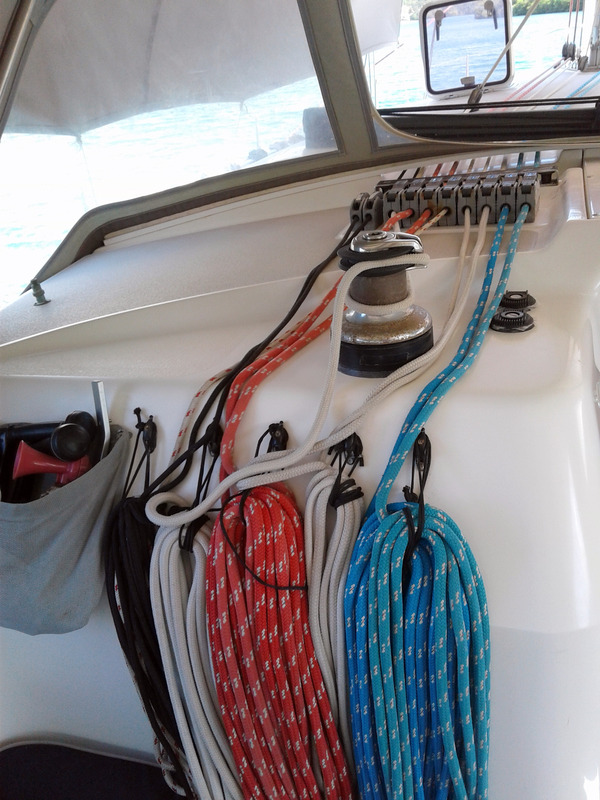 With a roller-furled jib and in-mast-furled main, plus lines that all lead to the cockpit, Pipe can easily be sailed by one or two people - all without ever having to leave the safety of the cockpit. One of the best things about living aboard a sailboat is the time spent with great friends. 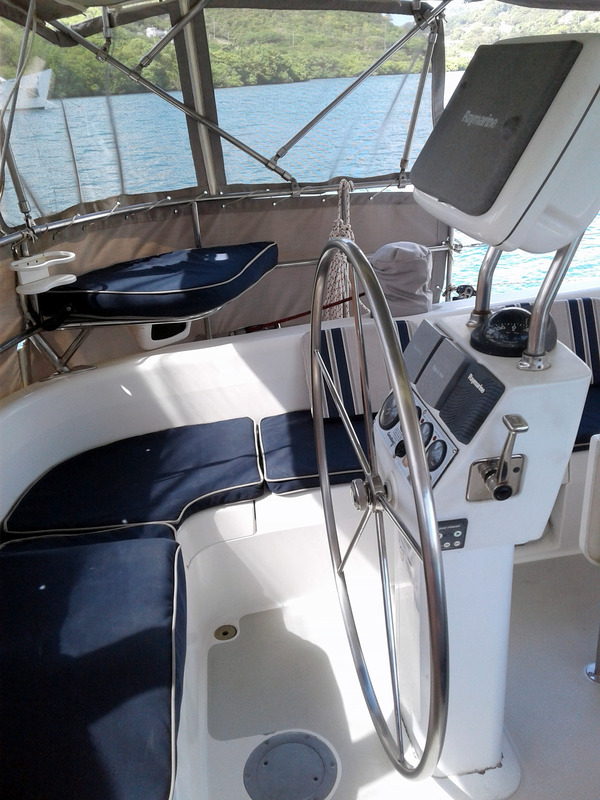 Pipe's cockpit is one of the roomiest seen on a monohull of her size, offering plenty of seating room for happy hours, potlucks, or more intimate gatherings. Relax on the closed-cell cockpit cushions and back pillows, which have been custom-covered with navy & blue marine-grade upholstery. 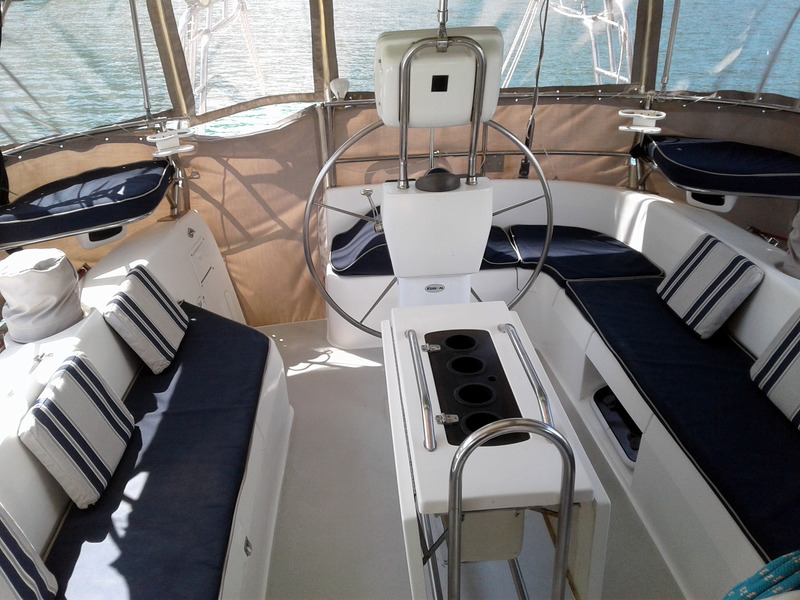 A hump-seat cushion sits at the helm, along with raised, cushioned corner seats port and starboard - all designed to provide better visibility when underway.Below deck, the multi-level deck salon design, along with NEW faux leather cream upholstery, creates a bright, open living space. The raised U-shaped dining area offers spectacular views through Pipe's large fixed windows. An adjustable dining table also allows you to have a smaller table for games or projects, or a larger table for meals and get-togethers. When you're ready to kick back with a book or a glass of wine, put your feet up in one of Pipe Muh Bligh's two recliners. Enjoy the plush three-person sofa, or lower the middle seat-back to access a convenient cocktail table. When it's time to start cooking, Pipe's galley has plenty of Corian-covered counter-space, along with a refrigerator/freezer, a 3-burner stove/oven (all replaced in 2018), and a microwave. Worried about running low on your favorite ingredients? There's ample storage for provisioning in all three benches around the dining table, plus a corner galley locker that stretches from counter-level to the hull.Whether it's nap-time or "cruiser midnight", enjoy a great sleep in Pipe Muh Bligh's V-berth or aft cabin. Each has a comfy, inner-spring mattress, and a large hatch over the V-berth's centerline bed lets you enjoy the cool Caribbean tradewinds. The V-berth has a private bathroom, while the aft cabin shares a bathroom with the salon/galley area (both include a sink, shower, electric toilet, and storage locker).With a 12-volt Spectra water-maker, a 7.6 kW Westerbeke genset, a D-400 wind generator, and three 275-watt solar panels, Pipe Muh Bligh is cruising-ready. Pipe is currently anchored on the south coast of Grenada, W.I., an island considered to be out of the hurricane "box" by most insurance companies. With its friendly people and wide range of yacht services, Grenada is an ideal place to begin your cruising adventure. Grenada has a number of lovely anchorages along its coasts, and is an easy day-hop to her sister island of Carriacou - the gateway to the Grenadines and beyond. Why spend months "easting" to get to Paradise? Pipe Muh Bligh is already there!